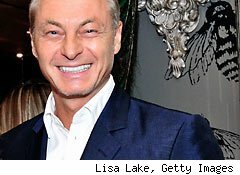 Edgar Huber will join Lands' End as its CEO, parent company Sears Holdings (SHLD) announced this week. Huber is leaving his post as executive vice president of global development for Liz Claiborne (LIZ). Previously, Huber served as the CEO of Juicy Couture and a top executive at L'Oréal. While his move doesn't mean that Juicy Couture's sassy bum logos will be adorning be adorning Lands' End chinos any time soon, it does suggest that Sears Holdings wants to rejuvenate the 48-year-old heritage brand, which originally sold nautical wear for sailors. In 2009, Lands' End launched Canvas, a new, younger collection blatantly modeled on J.Crew. The Canvas campaign video was a vision of prep paradise, with cheery 20-somethings in oxfords and V-neck sweaters painting in an exposed-brick studio. But perhaps it's Sears Holdings itself that needs a new paint job. Since its 2005 merger with Kmart, Sears's attempts at re-branding mostly have flopped. As The New York Times recently noted, neither the constantly changing Sears slogan nor the plethora of different kinds of stores (Grand, Big, Super, Hardware, Home, Outlet and even a retro-themed Sears in Georgia) have helped the company. In the first quarter of 2011, the company reported a loss of 3.6%. The Huber hire seems to be part of a new effort at restructuring management: On Wednesday, Sears Holdings named Monica Woo, former chief marketing officer at online grocer FreshDirect, as its new chief marketing officer. "The news comes at a time when the parent of Sears department stores and the Kmart discount chain faces tremendous pressure to upgrade its stores and improve its merchandise mix and customer service," Reuters reported. Morningstar analyst Paul Swinand told the publication that the move seems to confirm Sears' push toward more online sales. Perhaps a successful Lands' End could serve as a lifeboat for sinking Sears. After all, the time is ripe for rehabbing classic labels. Earlier this week Gap launched a 1969 line, based on styles from the year it was founded. Pendleton and Carhartt are among other brands who have managed to repackage their working-class roots as retro-chic. Huber, with his "deep background in retailing and brand building," as Sears' CEO Lou D'Ambrosio put it on Monday, may be the man for the job. Among other accomplishments, Huber expanded Kiehls -- a bath-products brand that had been family owned for 149 years until L'Oréal acquired it in 2000 -- from two stores to over 60 stores during his time at L'Oréal.